Did you take General Psych in school? Do you remember Erikson’s psychosocial stages of development? As a sociology major and then an occupational therapist, I distinctly recall studying this several times. Now that I’m, um, older, I think I’ve found a weak spot in his thinking…. to take us from the age of 18 until death. Or how about these — Discovering that raising kids to be independent is the right thing to do but hurts like the dickens? Realizing that you caused your own parents a boatload of pain and worry but they never let on? Seeing aging in a whole new light once age 50 or 60 hits? Wondering who will “go first,” you or your spouse? And these are only the highlights. I personally think Mr. Erikson skimmed over way too much stuff. Erikson’s problematic schema aside, I am so thankful that we do change and learn and grow. Can you imagine how dull life might be otherwise? A couple days later, Diane added: “And would you put butterflies on it?” Butterflies — to depict the unfolding days ahead for her mom, now no longer with her mate by her side, but with instead a whole realm of new possibilities. In the photo above, 1) the brown patch that the pansies are on, and below, 2) the cream-colored stripe and 3) the “checkerboard” under the blue butterfly. His sweaters make a beautiful background for the new butterflies, just breaking forth now and finding their way. And back to Erikson — he lived until nearly age 92. Do you imagine that just MAYBE he had a couple more chapters brewing in his mind by then? Joan, how did I miss seeing this post back in May? Encouraged by reading the posting. Of course, the blanket is beautiful. :) Can we go for coffee sometime soon? Miss you! Beautiful as always. I love the butterflies! They’re simple and elegant. 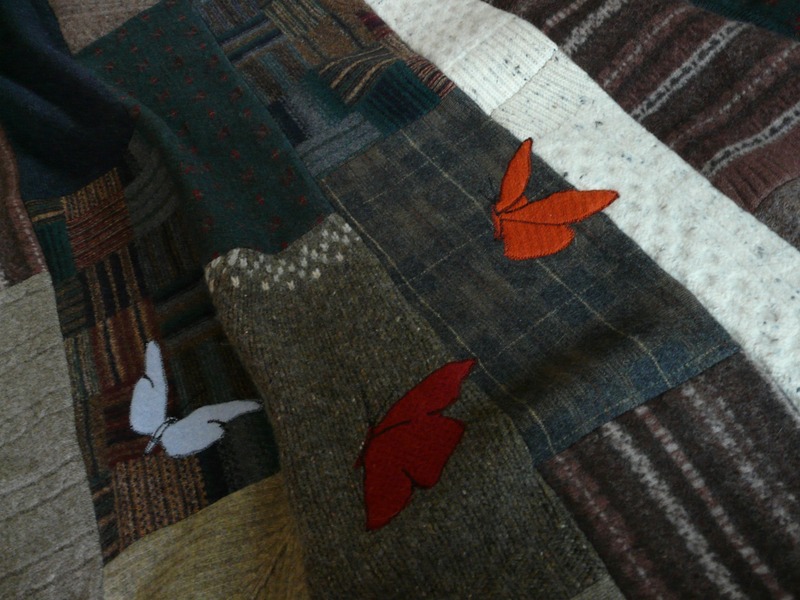 Joanie – I just absolutely love the butterflies and the way you styled them on that blanket makes them look as though they are actually flitting around. It’s a happy blanket – very special. Love you, Mom. It is an amazing blanket and I will cherish it the rest of my life. Thank you so very much. “Sigh” is right. I’m always grateful for other women who understand. I love the entire analogy and thought process, Joan! The blanket, too, is beautiful and sentimental. Well done. It is so beautiful! What a beautiful keepsake and reminder to look forward…..
You did an amazing job, I can not thank you enough. Aw, missy, you are welcome. YOU inspire me, as you know. I liked it a lot Joannie. You are an amazing lady.